In a medium bowl combine the beef, breadcrumbs, egg, ketchup, Worcestershire sauce, Dijon and parsley. Score the meat dividing into 5-6 oval-shaped patties about an inch thick then season with salt and pepper on both sides. Heat the oil and one tablespoon of butter in a skillet over medium-high heat. Add the patties to the skillet, searing on both sides to nice brown, caramelized color then transfer them to a plate. Add the onions, garlic and mushrooms to the skillet and sauté allowing the onions to caramelize. Just before they’re finished cooking, season with salt and pepper. Cook another couple of minutes then transfer the onions/garlic/mushrooms to the plate patties. Lower the heat to medium and add the remaining 2 tablespoons of butter to the skillet. When the butter melts whisk in the flour and cook over low heat 1 minute. Whisk the beef stock, McCormick Au jus seasoning, Dijon, Worcestershire and dried thyme making sure to scrape up any browned bits from the bottom of the skillet. 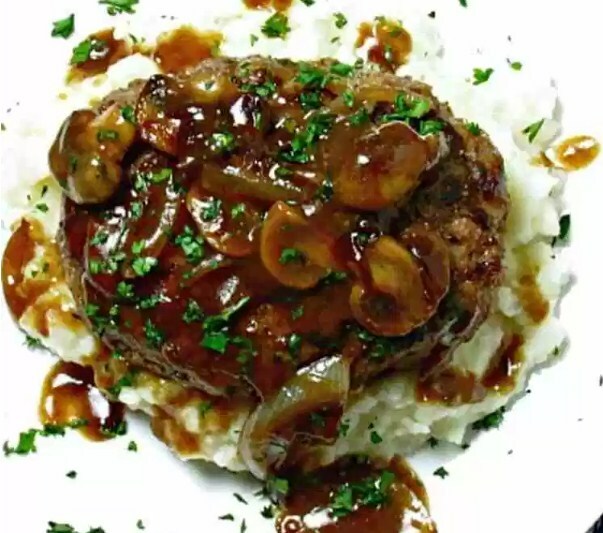 Return the onions/garlic/mushrooms to the skillet, combining then gently nestle the Salisbury Steaks into the gravy along with any leftover juice left on the plate. Cover and cook over low heat about 10 minutes or until the gravy has thickened and the Salisbury Steaks are cooked through. Taste and adjust salt and pepper as necessary. If you prefer a thinner gravy, add another splash of beef stock or cold water.